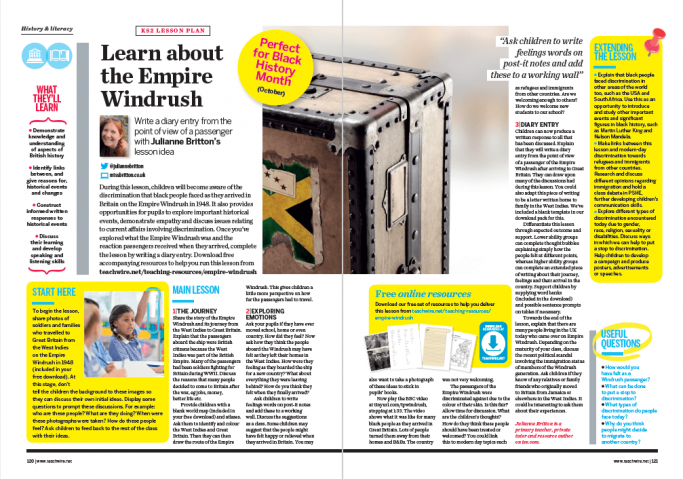 I am pleased to announce that I have contributed to this month’s issue of Teach Primary magazine with a Key Stage 2 lesson plan for Black History Month. The lesson focuses on the passengers of the Empire Windrush and the discrimination they faced upon entry to the UK. I have taught (versions of) this lesson to several classes and I always feel it has been successful. Whilst being both engaging and challenging, it also provides opportunities for pupils to: explore important historical events; demonstrate empathy; and discuss issues relating to current affairs involving discrimination.